The full-service electrical contractors that businesses and homeowners in the Weston, Massachusetts, area have grown to trust are the experts at VMA Electric. Whether you need wiring for a new office building or a security system installed at your home, we have the skill and experience necessary to do the job right the first time. We’ve been serving the MetroWest region since 2008 and take pride in the fact that our highly trained staff brings an unmatched level of expertise to every installation or repair we do. Additionally, our owner, Victor Archila, requires his employees to stay current regarding the latest industry innovations and best practices, so VMA Electric can stand out from competing electrical contractors. And, because a circuit could blow or an outlet could begin sparking at any time, day or night, we provide emergency service 24 hours a day, seven days a week. We’re also confident in the quality of the service we provide, so we back our work with a one-year guarantee. If you would like to learn more about why VMA Electric is one of the most trusted electrical contractors serving the Weston, MA, area, contact us today. 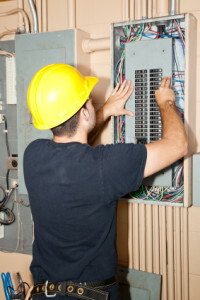 We are standing by to tend to your electrical needs.